Changing demographics in the 8th Congressional District may have played a role in the defeat of Republican Dino Rossi, handing the district over to the Democrats for the first time. The 8th Congressional District was supposed to get more conservative, not less. That’s what The Seattle Times reported back in December 2011. At that time, the state’s bipartisan redistricting commission was working on a plan to reconfigure the political map of Washington in the wake of the 2010 U.S. Census. The plan was adopted, and the 8th lost territory on the Eastside while gaining more rural areas in Central Washington. But if this already-red district was redrawn more conservative just six years ago, how did Democrat Kim Schrier just pull off a victory over Republican Dino Rossi, who conceded Wednesday evening? There are a lot of factors that go into creating a winning political formula, including, of course, the candidate herself. There are the issues, the messaging, the money, the ads, the ground game, the other races on the ballot, and so on. But never underestimate the power of demographic forces. They’ve brought dramatic change to some parts of Washington, including the 8th. These changes may have helped turn the district blue for the first time, something nobody could have anticipated happening back in 2011, when the redistricting plans were being finalized. The 8th sprawls through King, Pierce, Chelan and Kittitas counties, covering 7,300 square miles, and is home to about 750,000 people. 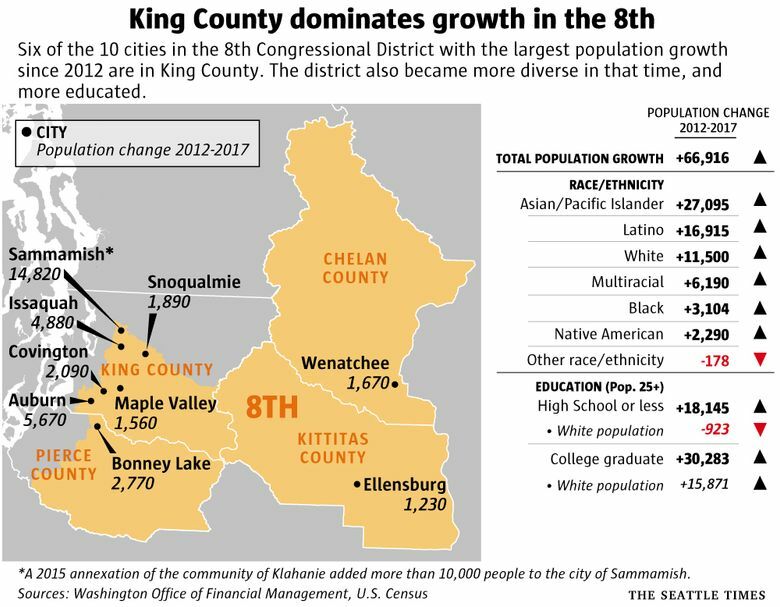 Census data show that within the district, population growth has been strongest in King County, especially in the parts of the district closest to Seattle, such as Sammamish and Issaquah. That was good news for Schrier, and not just because she lives in Issaquah. As we’ve seen in other parts of the country, these suburban/exurban areas, with many highly-educated and professional inhabitants, are turning away from President Donald Trump and the Republican Party. It looks like that’s what happened here in the 8th — and it’s worth noting that if you combine the populations of Sammamish and Issaquah, a remarkable 70 percent of residents aged 25 and up have a bachelor’s degree or higher. Data from the Pew Research Center show that in the past 10 years, college-educated voters have become increasingly liberal, with the Democratic Party now holding a 53-to-41 percent advantage over Republicans among this demographic nationally. And in the 8th Congressional District, the number of college-educated residents has grown at a rate nearly four times that of the population without a college degree since 2012. As the suburbs have turned blue, rural parts of the country have become the Republican stronghold. White working-class voters — that’s demographic shorthand for white adults who do not have a four-year college degree — now make up 59 percent of Republican voters nationally, according to Pew. And while it remains a huge voting block, its numbers are starting to decline. In a recent column, I looked at this trend in Washington, and found that even as our state registered double-digit population growth, the number of white adults without a college degree hasn’t changed since the start of the decade. This trend holds true for the 8th. In total, the district’s population grew by 10 percent from 2012 to 2017, but the number of white adults without a college degree didn’t increase at all. As a result, this group is no longer the majority of the 25-and-up population in the district, shrinking from 55 to 49 percent in just five years. Meanwhile, the 8th also grew much more racially diverse in this period. People of color increased their share of the population by 5 percentage points, and now make up 31 percent of the total. Growth was particularly strong among people of Asian and Latino descent. The white population only increased by about 2 percent. This is another demographic trend that may have helped Schrier and hurt Rossi, since data show that people of color are more likely to vote blue, regardless of their level of education. That’s particularly true of black voters, according to Pew, but Latino and Asian voters are also solidly Democratic. 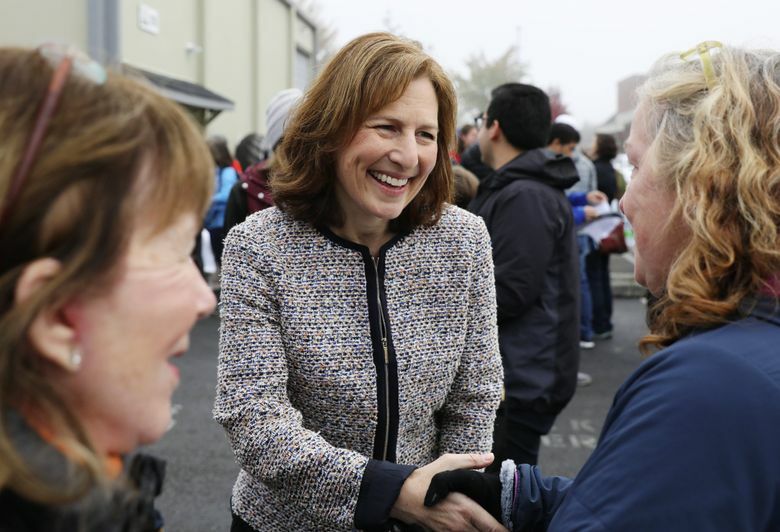 Schrier’s victory was part of larger trend — what’s been described as a “suburban revolt” — that caused many other seats to flip from red to blue, and resulted in Democrats regaining control of the House for the first time since 2010. Editor’s note: A 2015 annexation of the community of Klahanie added more than 10,000 people to the city of Sammamish.